Sometimes I can barely tell if I’m awake or sleeping. I get up early and try to grip each day like I’m gripping a baseball but my focus falters and the day swells beyond my grasp, a helium balloon escaping, too big and slippery to hold, floating up and away into the blue or out toward the edge of the blurry horizon. Going, going, gone. I woke up early this morning and the first thing I focused on was this 1975 Clyde Wright card, its background familiar: a world for directionless wandering. It looked less like a baseball field than a deadened seaside heath creased with sandy meandering paths. The presence of the uniformed player in the foreground made me think that the background was actually some special field designed for a strange mutation of baseball that features several diverging basepaths instead of the familiar unequivocal diamond. In this mutation baserunners must decide which basepath to run down, some runners by chance choosing a route bringing them back home while others branch off into wider and ever more hopeless digressions. The games never officially end, not really, their box scores always marked with multiple asterisks to signal all the runners still spiraling deeper and deeper into an almost surely inescapable maze of bad choices. These games would only be played in natural light and would end when the sun went down, some runs in, some outs recorded, the voices of the unaccounted echoing back toward the half-empty dugouts in the dusk. Clyde Wright seems to have some familiarity with the game of shadows and fog apparently set to commence on the field behind him. He has just finished a season in which he won only 9 games and lost 20, and by the time this image of him will appear in packs of baseball cards he will already have been shipped off to the Rangers in exchange for fellow Cardboard God netherworld wanderer Pete Broberg, missing by mere months the chance to be a teammate of a third denizen of the era’s ethereal marginalia, Kurt Bevacqua. In fact, due to a mistake, this card relates the erroneous news that Clyde Wright has never yet officially been a Brewer, his statistics listing all of his seasons including the most recent one as being in the employ of the Angels. 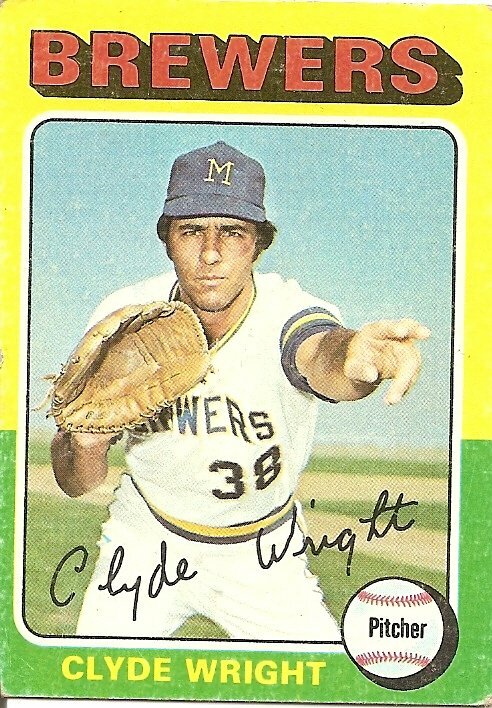 In truth he had turned in his fresh 20-loss season for the Brewers, but in the world of this card he is only theoretically a Brewer, and when this conditional status is combined with his impending trade to the Rangers the Clyde Wright of this card becomes someone who is neither here nor there, not an Angel, not a Brewer, not a Ranger. He is nowhere. You can see by the expression on his face that he doesn’t like this. It will only get worse. Within a year he will be out of the majors, then he will play for a while in Japan, where a predilection for alcohol will bloom into fullblown addiction, that eroding realm where one wrong turn gives way to the next and the next and the next until getting back to where you started begins to seem impossible. But there is some resolve in Clyde Wright’s face, too. This is after all the first Angel to ever pitch a no-hitter (Correction: As pointed out in the comments below, the great Bo Belinsky actually pitched the first Angels no-hitter. ), and the team’s second ever 20-game winner, and still the holder of the franchise record for most wins in a season by a lefty. And this is the man who did in fact fight his way back out of all the wrong turns and spiraling, waning cul de sacs, who eventually got sober (he now runs the Clyde Wright Pitching School back in Anaheim). So even though in the nowhere moment of this card he is on the brink of slipping off into oblivion there is something in his tense features that hints of his unwillingness to quietly disappear. And this troubled battler seems to be pointing. When I woke up this morning, early, teetering between dream-weighted sleep and an unholdable helium day, my gaze drifted past Clyde Wright toward the background of this card. Clyde Wright was trying to point back into my life. “Don’t come this way,” he seemed to be saying. But then again he had his glove hand open and nothing in it, as if he required me to grab hold of the day as if it were a baseball and throw it at his target, as if he required me to not turn around and walk away but rather to join him in his world. The day ended up swelling and slipping from my grasp and here I am, once again, inside another Cardboard God landscape, wandering the labyrinth of paths that all eventually dissolve into infinity beyond the falling Angel. You are currently browsing the archives for the Clyde Wright category.